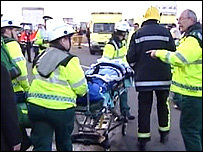 An investigation is continuing into how an Isle of Wight car ferry crashed into a ramp at Southampton Docks, injuring nine people. 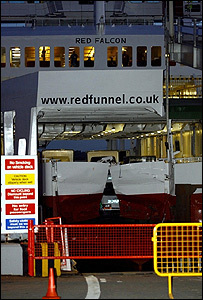 The Red Falcon, which crosses from Cowes to the Red Funnel terminal in Southampton, was carrying about 130 passengers and 14 crew when it crashed. Red Funnel said eight passengers and one crew member had sustained "minor injuries". The ferry was also damaged. Several passengers and their cars were trapped on board until late at night. One of the nine injured was said to have been knocked unconscious, while another had broken fingers. A spokesman for the Maritime and Coastguard Agency (MCA) said a number of other passengers had also needed treatment by ambulance staff. The ferry was also carrying one person who was in an ambulance being transported across from the Isle of Wight for hospital treatment. She was taken off the ferry, but other vehicles remained trapped for some time. Mark Clarke, from Solent Coastguard, described it as "quite a major incident" and "fairly chaotic". "She [Red Falcon] was coming across from the Isle of Wight and hit something called the linkspan, which obviously disembarks, embarks passengers, with some force, and the bow doors are significantly damaged," he said. Tom Docherty, from the Red Funnel Company, which also owns the ferry, told BBC News 24 he was shocked that a routine arrival had gone so wrong. "This is something we do over 100 times a day, you know, so it's quite routine for us. We've got a great safety record, so we're all shocked that this has happened." Reuters' Paul Chapman, a regular traveller on the ferry who was in his car on the top deck when the collision happened, said the vessel appeared to have approached the dock faster than usual. "Normally they slow up almost to a walking pace when they come into the port. "We could see the gantry coming in towards us - it must have been a good 10 miles a hour," he said. The route is one of the main links between the Isle of Wight and the mainland. A spokesman for Red Funnel said: "The damage is currently being assessed and Red Funnel is working closely with the authorities to determine the cause of the accident." Hampshire Police said the incident would lead to "considerable disruption" to ferry services to and from the island. Vehicles seeking to travel to the island were being diverted to Southampton's Leisure World complex on West Quay Road, which was being used as a holding area. Wightlink ferries is still running its services as normal. You can send pictures and video to: yourpics@bbc.co.uk or to send via MMS please dial 07725 100 100.